It was good yesterday to see Arthur Pendragon’s request for a judicial review about the Stonehenge burials thrown out, though not a surprise. His complaint was that he had not been consulted over the decision to grant an extension on the licence to examine the cremated remains we excavated in 2008. We were originally given two years to study these before their reburial (or, as the self-styled Battlechieftain put it, to “conduct experiments upon ancestral human remains”), and last year we were given a further five years. Arthur’s a good speaker, and with his robes and beard makes a good interviewee. He is a colourful sideshow for the media, and for visitors to Stonehenge where he has been staging a protest for many years. But he has wasted a great deal of archaeologists’ time over this issue (which can be translated into taxpayers’ money in many cases), where there should never really be any question about what is the right thing to do. There is often more to his words than appear on the surface. This is not a fair description of reality. Along with some other Pagans, Arthur has had special access to behind the scenes discussions at Stonehenge, overseen by English Heritage, for several years. In correspondence with the Ministry of Justice last year, he was told that “it is proposed that once the work has been completed the religious views of the Pagans and Druids will be respected and the remains reinterred” (email from Rupert Clayton, Coroners And Burials Division Ministry of Justice, to Arthur Pendragon November 2 2010). This was a position taken by the MoJ that we were not told about (the email came to light in Arthur’s evidence to court). It is a nonsense for Arthur to talk about his being excluded by a “collusion”. Sadly, history tell us not to expect Arthur to drop the issue now that his request for a judicial review has been rejected. He will move the goalposts and pick up a different ball, and waste more of our time. This is the basic story of these precious Stonehenge cremations. 1. They were originally excavated by William Hawley, mostly in the 1920s, found unexpectedly in an arc at the edge of the site close to the encircling bank and ditch. We can not know precisely what he found, as the records are not that good, but we think there were around 50 burials. 7. In the meantime, following a public campaign by archaeologists that I have written about elsewhere on this blog, the ministry revised its approach to licensing. New licenses now allow for the option of retaining archaeological human remains indefinitely. So while it is strictly correct, as the press reported yesterday, that the Stonehenge cremation burials are to be reburied in a few years’ time, we have every right to expect that in fact the license will be changed to allow for permanent retention – which of course is what we believe strongly should happen. And just as I posted the above, I heard the excellent news that our position is supported by the British Humanist Association. It occurs to me that we might well have a compromise solution to some of Arthur’s arguments when the visitors’ centre of Stonehenge is eventually revamped. As I see it, one good was to replace the current centre would be to build a new centre to the south-east of Stonehenge, and access the stones via a new underpass under the A303. Then close the present A344 past Stonehenge and remove most of the current visitors’ centre there. This leaves us with an unexpected gift from the work: the present underpass under the A344 is slap-bang next to Stonehenge (indeed I would argue it is on the Stonehenge site), and has cut through all the existing archaeology. If we were to replace this underpass under the then-closed road with a bone repository, then we could convincingly argue that ancient bone redeposited in this repository had been “reburied” at Stonehenge, whilst remaining in controlled conditions where archaeologists could recover the bone at a future time. Shifting the visitors centre away from Stonehenge is also a very good idea, in my limited opinion; one might also seek to hide the A303 from the stones with a hawthorn hedge to the immediate north of the road. I am taking my ideas for how best to manage an ancient monument from the Irish Boyne Valley monuments; they manage visitors by putting the car park out of sight of their monuments, using trees to help conceal it, and shifting visitors around in small parties with a guide for each party. A similar strategy could, and would work well at Stonehenge, especially if the infrastructure for it were minimised and hidden as much as possible. I think Arthur and supporters are truly amazing defending common decency – this is what this is – the right thing to do – when will a time come when people realise that science cannot predict everything ………. leave well alone i say and put the stones back – Arthur please do not give up hopw you have many people backing you and it is about time that people put more money into backing you………………..
@ Rachel Gison. My dear, funny you should praise Arthur when it’s one of his remits to open the stones for all! This would destroy it rather than preserve it. As for your comment about people trying to work out what Stonehenge is – I’d rather have knowledge than new age fluffy theories based on just someone’s uneducated ‘feelings’ and fanciful imaginings as these people are often so one-sided in their ideas, they miss even the most basic of evidence. It seems lately that the ramblings of these types of attention seekers like Arthur are just as valid as those of qualified academics who have years of anthropological and archaeological experience with these sites and their remains. This is the only misjustice. As for the sanctity of human remains – neolithic and bronze age cultures commonly moved human remains about. You have half of a man’s torso in the middle of a hengiform monument near to Stonehenge. You have skulls and bones from barrows missing as they were taken out by their families for ritual and just never replaced. We cannot judge these things with modern day sensibilities. Whether you think you are pagan, or not, you’re looking at this from a very “christian” viewpoint, not the viewpoint of the person who deposited them, 4,500+ years ago. Justice has prevailed here. Hail Mike, You are quite right. At last we are in full agreement. I will not go quietly into the night, on this one and nor will ‘our’ Great British Ancestors. and yes I include you and Mike Parker-Pearson in the ‘our’, it’s the Royal We…..
Becuase I don’t think the concept of Britain was around 3000 years ago. Sounds like race discrimination. You’re force-labelling them as “British” when they have no voice to speak for themselves. Beleving that you have ‘Royal’ Right to bear arms in a megalithic site shows just how much you respect the “Ancestors’ You claim to serve. Perhaps Steel weapons would be apropriate in a reenactor context on an Iron age Monument. We always knew the establishment would get its way and no doubt permission will be granted for you to retain the remains indefinitely. I find the whole matter appalling – archaeologists allowed to excavate an Aubrey Hole and remove remains from their sacred burial site to store in a box in a labatory. In the name of science you claim – and what life changing events do you hope to discover by retaining these remains? I have a certain amount of sympathy with the viewpoint that the remains were buried on that site for a reason and that by removing them we are going against the wishes of the individuals involved, and surely there can be no question as to the probability of such a position at Stonehenge. But I can also see the potential for the information that could be gained from the periodic examination of these remains using technology as it advances, so I find myself in agreement with the position of returning the remains in a purpose built structure, possibly consecrated with Pagan ritual, on site allowing access at later dates through a licencing system that takes into consideration the views of all interested parties. Great news. The less media attention this nut, or self proclaimed “king of the druids” or whatever title he gave himself gets, the better. I sense he’s also missing the irony that if “King Arthur” existed at all then he was a post-Roman Briton, and not a “Madgikal Mystikal Faery Celt” and would therefore have been a Christian, and not a pagan. Can someone ask him nicely to stop wasting time, and tax payers money and let the research continue so we can better understand this world heritage site? Also, corvusrouge, can I ask. How is returning the remains in a purpose built structure and giving them a modern “pagan” blessing beneficial to the spiritual well being of the deceased? That is as far removed from the original burial practice as keeping them in a laboratory is. That is not how they were originally interned, and it was not how they would want to have been interned. Using a modern invented branch of neo paganism to bury the bodies of 3000 year old people would be the equivilent to giving a Muslim a Hindu funeral. It appears it would only satisfy the modern “pagan” populace who seem to have made it their self proclaimed duty to speak for those buried at stone henge despite having no real reason to. I do think it is morally wrong to remove remains from their burial site. The bones should be studied, and replaced. Not with some silly ceremony that has nothing to do with it, just simply replaced, carefully and respectfully. However, know what archaeological funding is like at the moment, I do not wan’t the see the bones sitting in boxes for another 20 years before they dealt with, perhaps the majority should be returned and a cross section kept for analysis. demands of science as well as those of us that wish to speak for the silent, What harm could it do to the deceased? Recent D.N.A. research [university of Wales, Re: Celtic From the West] Indicates that over 60% of our Microchondial D.N.A. Is Neolithic. They are All of our Ancestors, and were Buried for a purpose. Perhaps you can Come up with a suitable ritual form for reinterment..? seeing as you Have a Superior stance to ‘Silly Neopagans’. as descendants Campaigning To have these remains Treated and returned with the respet that is their due. An agreement can be reached that satisfies ALL parties, Is This Not Worth Working Towards? No one party has any ‘right’ to the remains buried at the Site of Stonehenge, certainly not a minority of ‘Druids’ whose ceremonies and way of life date back no further than the celtic revivals of the 18th and 19th centuries. Personally I am always disgusted at the behaviour of the so called ‘guardians’ of this site every solstice, trampling over the ground, climbing the stones, leaving the place a bomb site afterwards for the tax payer to clean up. I am fascinated with the history of the many peoples who have lived in these small islands of ours, especially those who lived here before the Roman invasion, and I welcome the work that archaeologists do to uncover new facts about our nation’s ancestors. The work may not be ‘life changing’ but neither is art, music, theatre, and I wouldn’t want to live in a world without those. Mr Rothwell should be ashamed of spending tax payers money on this ‘battle’ of his. The mythical Arthur was often portrayed as trying to build a better society for his people, while Mr Rothwell is just trying to prove a point. He should be putting his misplaced passions into helping this present society of its current ills, rather than fighting for the ‘rights’ of people long gone, about whom we know virtually nothing. The little we DO know is not due to his protests but the tireless work of archaeologists who have brought these people to life more than he ever has. It might surprise you to learn that many Druids, and I include myself in this, share your disgust at people climbing the stones and leaving the site a mess after solstice. I could add that for a minority, alcohol or drug abuse and bad behaviour add to a sense of violation of the sacred space. The Druids have to work within boundaries set for us by English Heritage and have no special means by which to police the behaviour of visitors to Solstice who pretty much can trample all over us also. We who go for genuine spiritual reasons do our best to retain some dignity and to serve others in such capacity as we are able. If we had no other reason at all to challenge the validity public benefit and morality of these digs, the very fact that tax payers money has been spent on them gives us that right. Solstice celebrations are paid from a very small fraction of the revenue generated by Stonehenge each year, and so does not cost the tax payer directly. I believe that you have in common with Arthur a strong desire to be associated with Stonehenge, you wish to speak as a representative of the archaeological cause and he speaks for his own interpretation of the Druid cause. You are both media aware and articulate people, but where the Druids stand at a distinct disadvantage in this debate is that the archaeological world has people in positions of considerable influence placed within the public bodies who should be regulating your activities and independantly finding the point of reasonable balance between points of view. Archaeology has the resources of commercial archaeology companies, funded organisations and Royal Societies with political influence. You have money, lawyers, full time helpers and access directly to advise the authorities and guide policy. The advantage is yours. It is so to such an extent that the fervor with which you have campaigned to mitigate the very slight risk that just this once you should have to compromise with those outside of this elite club in my opinion almost amounts to bullying. You say that we have been consulted. We were not informed that the policy of interpretation of the Burial Act 1857 is now to give archaeologists unlimited access to our ancestors. That you now suggest you might be able to keep these Stonehenge ancestors from reburial indefinitely fully vindicates Arthur and myself for disbelieving EH three years ago when they told us not to worry, we would get our ancestors returned last year, or Mike Parker Pearson when he informed us that his research would complete on time, or the archaeological community who would like to be seen to be honourable. In your book Hengeworld you tell the story of Archaeology at Stonehenge and of the reckless damage, loss of information, loss of finds, failure to document that 100 years of trusting the ‘experts’ has wrought on this precious place. It has a great value in illuminating our prehistoric capabilities only matched by its continuing worth as a sacred place of the ancestors and those today who revere them. A ballance should be found between these two, and we have sought throughout to find compromise only to discover that leading lights like yourself have presented this as being the end of your livelihoods. Arthur likes to give the impression that he is the one leading opposition to this violation against truth, but there are others not so encumbered by the need to grandstand who if it takes a further hundred years will undo this wrong. Archaeologists have missed a great opportunity in your haste to mock the Druids and escape legal constraints. The real reason that so much harm has been done to Stonehenge by archaeology has been that projects are not being adequately funded and once granted licence have not been properly regulated. We would support the riverside project in this research being completed quickly and recorded properly, two years of study would have been more than adequate had they been funded only to provide one part time student to study these remains. We want them reburied, in sealed containers that would preserve them for future research if justified but also achieve their return to the Earth at Stonehenge. We have never suggested that no research should take place. If you dare to question the common assumption that Druids have a start date 1600 years after Stonehenge was constructed, and therefore having no connection with it, then you might discover that it is not at all as well supported by the actual evidence as it is convenient as an argument to isolate people with Druidical beliefs of today from being granted any legitimacy which they might use to challenge the exploitation of Stonehenge. The evidence contrary to this ‘disconnection theory’ comes from the world of science and points now to Druids having been established long before they were written about by classical observers and who’s believes were founded upon a blend of Celtic and Pre Celtic perspectives. A judicial review would have benefitted all sides in this debate, and would have been very much in the public interest. It would have allowed the reburial / spiritual community an opportunity to present the reasons why a balance between the needs of science and the needs of the spiritual community could be made to work without harm to eithers position, and might even lead towards better understanding and cooperation. We have throughout our campain been generous in our general praise of Mike Parker Pearson for the quality of his work and our regard for the potential benefits of his achaeology. We would have contrasted this with the harm done by under funding and the lack of central recording of evidence available to the public in who’s interests it should serve. You would have also had the opportunity to speak about the benefits of archaeological work, of the need for proper funding, and to have shown sensitivity to the ligitimate spiritual concerns held by so many people of so many faiths regarding this issue. Instead you seem to be gloating over your ability to do as you wish answering to no-one. You are showing the world that the attitude of Brtish Archaeology today has not advanced so very far from that of the treasure hunters of bygone times who travelled the world taking whatever they wished. How will history and more enlightened generations look at you? the attitude of the Author of this piece who evidently believes that ‘valuable data’ overides all other concerns. I have nothing against research when done sensitively, but this is seldom the case. Alcohol within this Site discontinued; This is a lethal combination in any cultural context. As regards Ancient Druids and Stonehenge It is infantile to assume that Druids Did not exist before people were there to record their presence. The jury is still out..But then, the easiest way to ‘Prove’ anything is to convenienty ignore anything that does not fit your favourite theory..
First, something that has long puzzled me. How do you know the dead from Stonehenge weren’t tortured and butchered and can’t wait to get as far away from there as possible, even to a box on a shelf. It’s a fifty-fifty bet isn’t it? Why should you be confident it is otherwise? Second, you seem to think this is an issue between Druids and archaeologists but in truth those are both junior stakeholders. I hesitate to say miniscule but they are. The public consultation revealed that “the vast majority of the adult population “support museums that wish to display and keep human bones for research purposes”. By what interpretation is that not the end of the matter? Democracy was invented by pagans, shouldn’t you honour the ancient dead? I would agree that for some of the bodies buried in the landscape around SH, their internment may well have been done as an act of hostility. It is also possible that some were buried there as an act that conferred the title of Guardian upon them, whether they were willing or not. However, the sheer volume of bodies found and the estimates as to the number of potential bodies still in the landscape, says to me that they ALL couldn’t have been involuntary burials. I would be interested if you could present any evidence that you may possess, that would suggest the contrary. The ages of the burials suggest that the earliest types of religious frameworks would have been in use for their last rites, and to the best of my knowledge, that is currently agreed to be Paganism. Again, I am always open to information as to the contrary that you or anyone else may possess. I understand the uneasiness that people may have to the prospect of some modern neo-pagans performing rites, but that uneasiness is fuelled by the stereo-typing used by the modern sound bite media. I cannot conceive how any religious rites performed by any other faith would be appropriate unless carbon dating placed the remains within the timeframe of later faiths, in which case, I would suggest an appropriate ritual performed by members from that faith would be in order. I’m not suggesting that Paganism have some sort of “exclusivity” as regards these remains if their dating places them within another timeframe. However, the fact remains that most will be placed within pre-christian eras. There are many Pagans out here, and I count myself in these numbers, that actually take their faith as seriously as any other faith. There cannot be any serious doubts as to SH being placed within this indigenous framework and the fact that there is no “proven” academically verified lineage between modern neo-paganism and classical paganism is equally valid to Christianity or any other faith. Archaeologists and religion… not a good mix to be honest! A posts like this from a learned person who should know better than to take a protest against what they are doing as a personal attack, also gives away a trait of archaeologist mind-set. Stonehenge is sacred, everyone agrees? Stonehenge is a World Heritage Site, agreed? … A sacred site should be left sacred, right? … A world hertiage site should be left intact, right? Problem is that both sides think they have a special right, or say, over these issues. They don’t! Archaeologists love to trash opponents to their ideas and ideals as “looney liberals” and use the words “Pagan” and “Druid” as an insult! Non-conformity to their ideas threatens them! Druids think that because they have been worshipping at Stonehenge for 300 years or so (certainly as long as the archaeologists have been digging! 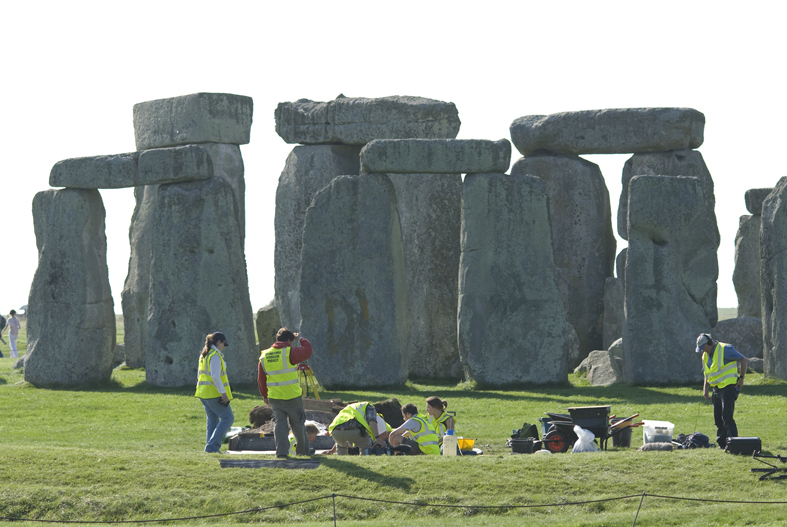 ), they can dictate what happens to the ancient remains of Stonehenge. So who is right? There are different opinions on how sensative issues should be resolved, and watching this fight for all these years has made me realize both the Druids and the Archaeologists are not much better than spoilt kids fighting over a new toy! Respect is a right, and both sides need to think just a little bit harder about this and COMPROMISE! You have the technology to wrap them safely so you can take them back out if needed!! It’s a simple solution… problem is archaeologists are as prissy as pagans, they love to have an opinion and be heard. Problem here is that there’s no one to bang their heads together! So the law needs to come in here and get them to sort it out! BUT, and this is a BIG BUT!!!! The establishment also dislike the Druids. (an anybody else who speaks out! Their supposed ‘Christian’ souls scream with fear when someone from a different belief structure comes along… They see them as crackpots, hippies and trouble causers costing the tax payer money…. BECAUSE OF CAUSE ARCHAEOLOGISTS DON’T GET FUNDING FROM THE GOVERNMENT DO THEY? JUDGES DON’T GET GRANT TO WALLPAPER THEIR OFFICES OR PAY FOR THEIR LUNCHES DO THEY? So before it does, I repeat…. Archaeologists, do your research and then put the remains back in the ‘hallowed’ ground, so there is no arguement from anyone… You have the technology to wrap them safely so you can take them back out if needed!! A glass case in a museum, right under their noses, is a slap in the face and shows English Heritage’s (and the archaeologist’s) total disrespect for anyone else! Conside that a verbal fatherly bashing of your heads together, and sort it out!